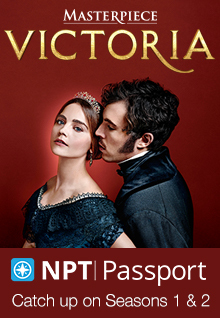 NPT and PBS have a special treat for Sherlock Holmes fans this month: Arthur & George, a new, three-part drama based on Julian Barnes’ acclaimed 2005 novel of the same name. The series airs Sundays at 7 p.m., Sept. 6 through 20, and stars Martin Clunes (Doc Martin) as Sir Arthur Conan Doyle, the creator of the beloved fictional detective. 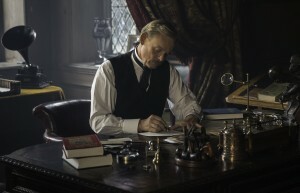 Martin Clunes as Arthur Conan Doyle in Arthur & George. Since his first appearance in the stories and novels of Sir Arthur Conan Doyle, Sherlock Holmes has been a favorite of fans around the world. The character has also proved popular with other writers who’ve re-interpreted the famous detective’s distinctive characteristics, methods and cases. PBS viewers have taken to the character in various series over the decades, including Sherlock, the striking modern and clever adaptation starring Benedict Cumberbatch as the consulting detective and Martin Freeman as John Watson, his more socially adapted colleague. Arthur & George is yet another twist on the Sherlock Holmes story. In this case based on a real incident, Sir Arthur is drawn out of mourning for his wife by an intriguing letter from George Edalji (Arsher Ali, The Missing), a young Anglo-Indian solicitor seeking to clear his name. At first Sir Arthur’s secretary, Alfred Wood (Charles Edwards, Downton Abbey), is pleased by his employer’s interest; later Woodie has his doubts. Arthur & George is a mix of suspenseful moments, spirited chases, and witty exchanges between the two male leads; think Young Sherlock Holmes meets Mystery’s 1980s/1990s Sherlock Holmes series. Holmes’ presence is felt throughout the drama; sometimes benignly such as when Sir Arthur is asked to sign books. At other times, to his annoyance, Holmes is held up as an unmatchable ideal: Sir Arthur is repeatedly told that his skills pale in comparison and that he is endangering Holmes’ reputation. If these instances create a few chuckles for viewers, they also reflect the conflicted relationship the writer had with his character (a situation often repeated by actors who take on the role). “If this were a story, I’d change the beginning, I’d change the end, or I’d try something else,” Sir Arthur tells Woodie in one scene. Viewers are unlikely to agree with him; preferring instead to keep Arthur & George just as it is. This entry was posted on September 4, 2015 at 3:29 pm. You can follow any responses to this entry through the RSS 2.0 feed. You can leave a response, or trackback from your own site.